By some key measures, the typical American household has slipped behind economically since the beginning of the 21st century. In 2013, the median income of U.S. households was $51,939, down substantially from $55,562 in 2001 (figures in 2013 dollars). In addition to two recessions – in 2001 and from 2007 to 2009 – longer-run trends such as globalization, the decline of unions, technological change and the rising cost of benefits such as health care are factors that limit prospects for many Americans. But how does the well-being of the American family compare with the well-being of people in other countries? The U.S. still fares very well on that score. 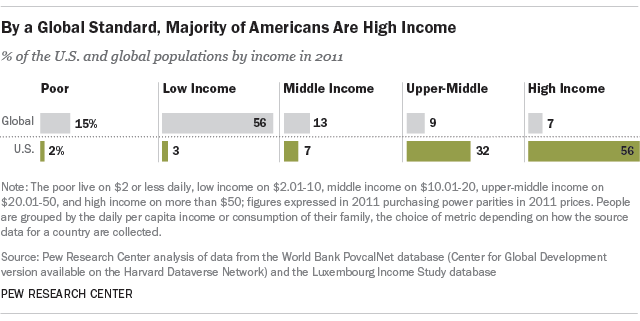 On a global scale, the vast majority of Americans are either upper-middle income or high income. And many Americans who are classified as “poor” by the U.S. government would be middle income globally, according to a new Pew Research Center analysis. The analysis includes 111 countries, which account for 88% of the global population. We divided people into five income groups: People who are poor (living on $2 or less daily), low income ($2.01-10), middle income ($10.01-20), upper-middle income ($20.01-50) and high income (more than $50). The global middle-income range translates to an annual income of $14,600 to $29,200 for a family of four. The U.S. stands head and shoulders above the rest of the world. More than half (56%) of Americans were high income by the global standard, living on more than $50 per day in 2011, the latest year that could be analyzed with the available data. Another 32% were upper-middle income. 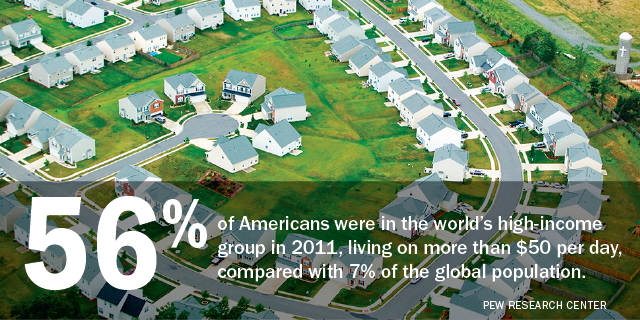 In other words, almost nine-in-ten Americans had a standard of living that was above the global middle-income standard. Only 7% of people in the U.S. were middle income, 3% were low income and 2% were poor. Compare that with the rest of the world, where 13% of people globally could be considered middle income in 2011. Most people in the world were either low income (56%) or poor (15%), and relatively few were upper-middle income (9%) or high income (7%). This is not to say that the U.S., along with other advanced economies, does not struggle with issues of income inequality and poverty. But given the much higher standard of living in the U.S., what is considered poor here is a level of income still not available to most people globally. In 2011, the official poverty line in the U.S. was $23,021 for a family of four, or $15.77 per day per person (the precise poverty line varies by household size and composition). That is a fair amount higher than the generally accepted $10 threshold for attaining global middle-income status. This means that many Americans who are poor by the U.S. standard would be middle income by the global standard, living on more than $10 per day. As it turns out, the $10 threshold is close to the median daily per capita income of U.S. households (officially) living in poverty: $11.45 in 2011, according to Pew Research estimates. In other words, more than half of Americans who are poor by U.S. government standards would be middle income when compared with the rest of the world. A fair share, however, would be either low income or poor, globally speaking. Nonetheless, the majority of Americans are part of the global high-income population that resides almost exclusively in Europe and North America. These two regions accounted for 87% of the global high-income population in 2011 – only slightly less than in 2001, when their share stood at 91%. The rest of the world has a lot of catching up to do.